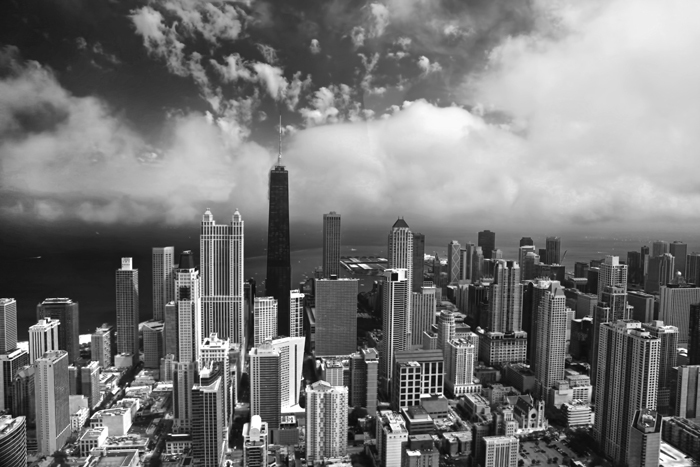 This black and white aerial photo of Chicago was taken in August 2011 and depicts the city’s River North and Streeterville neighborhoods with Lake Michigan prominently in the background. Low clouds make for a stunningly interesting photo of the city as the helicopter flies above the north branch of the Chicago River. Check out this rest of my Chicago photos, including skyline shots from the south side and along the Chicago River. Aerial Black and White Photo of Chicago, North Loop by Joey B. Lax-Salinas is licensed under a Creative Commons Attribution-NonCommercial-NoDerivs 3.0 Unported License. Permissions beyond the scope of this license may be available at http://www.joeyblsphotography.com. 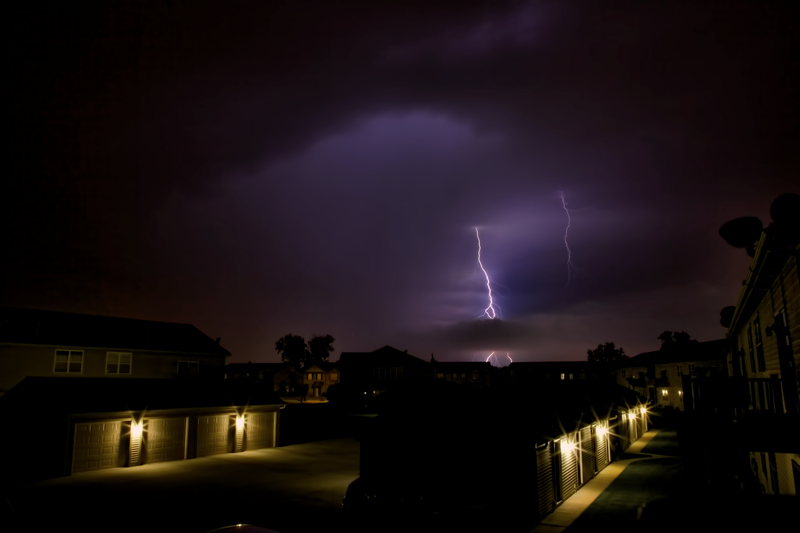 Storms pass through the Chicago and Northwest Indiana area on the evening of July 18, 2012. This photo is of a lightning bolt taken from Schererville, Indiana as the storms moved to the west, passing through Hammond, Highland, Munster and Dyer. This photo is facing directly north towards Highland. Click the image to see full resolution version (approx. 5600 x 3600). View my other weather photos. NEWS AGENCIES: You have my permission to use this photo in any news broadcast or news publication with credit attributed to Joey B. Lax-Salinas / JoeyBLS Photography or site my website, JoeyBLSPhotography.com. 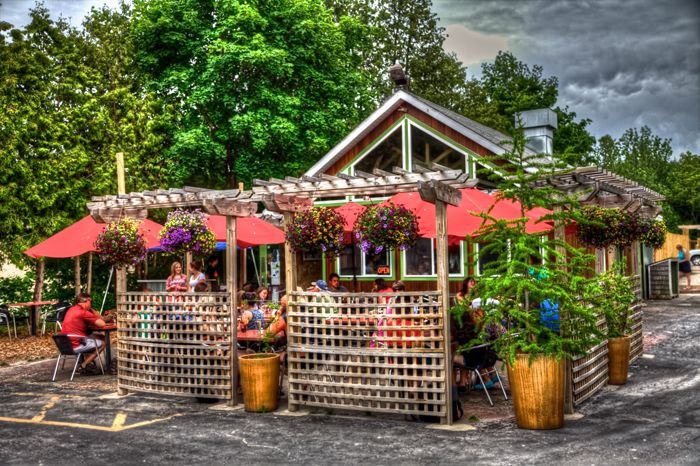 Door County has a wide variety of restaurants to choose from. Whether you are looking for fine dining or casual bars and pubs, Door County truly has it all, but I assure you; there is no place in Door County with more natural flavor, with such a warm and inviting atmosphere, and with staff so genuinely friendly and happy than you would at Wild Tomato Wood-Fired Pizza and Grille, located in Fish Creek along HWY 42 in Door County, Wisconsin. I rate this place 5 out of 5 stars! This place truly is remarkable. Owned and operated by seasonal residents Britton and Sara Unkefer, Wild Tomato offers delicious dinners including wood-fired pizzas, sandwiches, salads, appetizers and more with a focus on using locally grown ingredients. Wild Tomato is focused on food sustainability and using practices that respect nature and the environment. I had the pleasure of eating here on the evening of Thursday, June 14, 2012 as Rose and I were visiting Door County for the weekend. We came across this place originally because we were searching for restaurants that were open until at least 10:00pm and found Wild Tomato and it’s overwhelmingly positive reviews online. We decided to make the drive from the Country House Resort in Sister Bay down the highway through Egg Harbor, then on to Wild Tomato where we came across a cute little restaurant still quite busy from a late dinner rush. We arrived only about 45 minutes before closing and still felt as if we were welcomed with open arms by the staff. 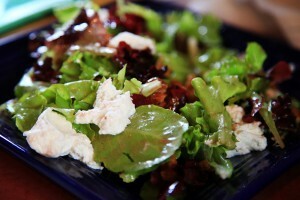 We were happy to hear that Wild Tomato uses natural ingredients and focuses on environmental responsibility, but once we took a bite of our first dish, a Cherry Walnut salad with maple roasted walnuts, cherry vinaigrette dressing and goat cheese, all was forgotten and we became lost in a cloud of pure bliss. It was absolutely delicious! Next came the pizza and it sure didn’t disappoint. We made up our own pizza, choosing pepperoni, basil and fresh mozzarella as our ingredients. The pizza crust came out deliciously crispy with a soft dough in the middle; the perfect combination. The rest of our night was spent talking and reminiscing about Wild Tomato and their ridiculously delicious Cherry Walnut salad. Rose and I found Wild Tomato so delicious and such an appealing restaurant that after checking out of our hotel in Sister Bay on Saturday afternoon, we found ourselves wanting more and headed down HWY 42 towards Fish Creek with a craving for salad and pizza. Sure enough when we arrived, the restaurant was busy, but we sat at the bar again in the same seats that we had sat in on Thursday night and ordered the exact same meal as we did two days prior. During this visit, we had the opportunity to meet Sara, one of the owners of Wild Tomato. Sara was very nice and gracious as she mingled with us and the other customers while also hustling to prepare for the beer festival happening a few miles away (PHOTO: Wild Tomato’s craft beer selection). Since returning home from Door County, I have already tried to remake the Cherry Walnut salad several times and stopped at the store to purchase the ingredients before even arriving home from our eight day road trip around Lake Michigan. In the first week back home alone, I made the salad at least four times and found myself telling my friends and pitching the idea to a local restaurant in Northwest Indiana. Although I did make a good salad, it certainly was no match for the Wild Tomato Cherry Walnut Salad, which I will surely continue to think about for the months to come. 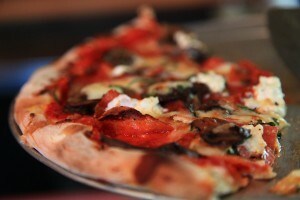 Watch the video above about Wild Tomato Wood-Fired Pizza and Grille! Wild Tomato Wood-Fired Pizza and Grille by Joey B. Lax-Salinas is licensed under a Creative Commons Attribution-NonCommercial-NoDerivs 3.0 Unported License. Permissions beyond the scope of this license may be available at http://www.joeyblsphotography.com.